Most homeowners have an assortment of tools at their disposal to help with trimming and taking care of their lawns. Pruning shears, trimmers, chainsaws, lawn mowers, the list can be virtually endless. However, one of the best tools you can have for safely trimming branches in high locations is a pole saw. This Sun Joe model has a modest weight of just under 8 lbs., making it easier and more comfortable to use for extended periods. The shaft is able to be extended to 9.4 ft., giving you an overhead reach of nearly 15 ft. 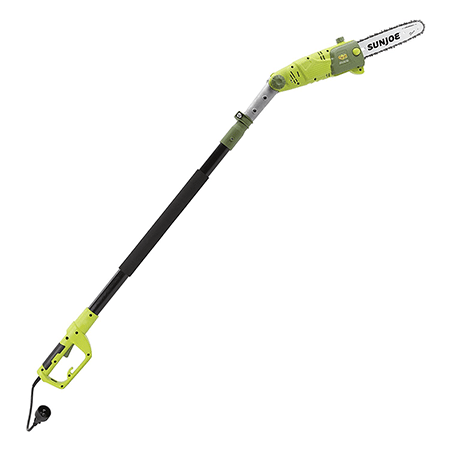 This model also features a positional head that can cut branches with a thickness of up to 7.5-inches at 30, 15, and 0-degree angles. The 6.5 Amp motor powers an 8-inch Oregon bar with an auto-oiler to help ensure that the chain stays properly lubricated. This model also features a built-in safety switch. The switch helps to prevent accidental starts. Being a refurbished saw means it comes with a limited, 90-day warranty. 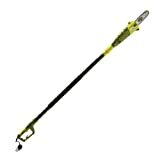 This telescoping electric pole saw from WEN expands from 6.5 ft. to 9 ft. The 8 lb. design helps to reduce user fatigue and features a tool-free tension system that makes tightening your chain simple. The automatic oiling system helps to ensure the chain stays lubricated and a built-in safety switch helps prevent accidental starts. A 6.5-Amp electric motor helps to provide plenty of power for most residential applications and rotates the chain at a little over 2,100 feet-per-minute. A scabbard, center handle that is adjustable, and a shoulder strap are also included. The second model from Sun Joe to make our list, the SWJ803E, provides you with a larger cutting chain and a beefier motor. In addition to being able to cut limbs safely, this electric pole saw has enough power that it can also be used for cutting thin logs. The SWJ830E can also expand to nearly 9.5 ft., affording an overhead reach of 15 ft. The cutting head can be adjusted between 0 and 30 degrees and the 8-Amp motor can cut materials up to 9.5-inches in thickness. The self-lubricating 10-inch Oregon bar and chain takes away some of the work involved in maintenance. Good value for the added power and capability. Even though the SWJ803E is a larger model, it still has a low weight of just under 8 lbs. On the pricier side of the price range when compared to similar models. This GreenWorks 20182 model features a fast-starting 6.5 Amp electric motor that provides power to an 8-inch Oregon bar and chain. The chain can be tightened easily with the built-in tensioning system and the automatic oiler ensures proper lubrication. The shaft can be extended to a maximum length of 8 ft. This model comes with its own specially designed storage case. Weighing just over 10 lbs., the 20182 is heavier than many comparable models. The WG309 is actually two tools in one. The cutting head can be used as a traditional chainsaw while adding the 8 ft. extension pole requires no tools and converts into a versatile pole saw. This saw features an automatic tensioning system and an automatic oil pump with a level indicator. The 10-inch bar and chain are powered by a beefy 8 Amp motor and provides enough power to handle nearly any task around the home. Can be used as a traditional chainsaw as well as a pole saw. Weighing 10 lbs., the WG309 is heavier than many comparable models, such as the Sun Joe SWJ803E. This is another versatile pole saw that comes from Earthwise. Depending on the task at hand, you can use this tool as an 8-inch chainsaw or a pole saw. The fiberglass pole attachment can extend 9 ft. while remaining lightweight. 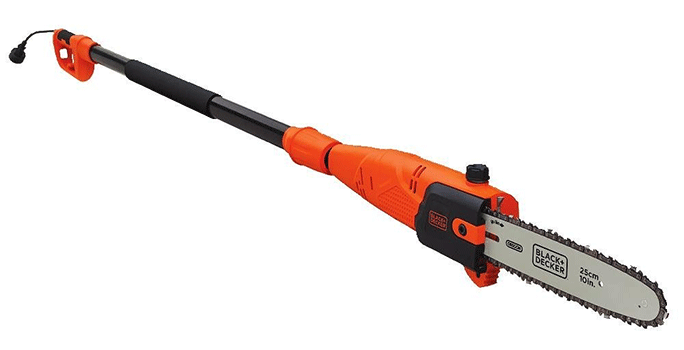 The 6.5 Amp motor enables this saw to cut branches of up to 6-inches in thickness. 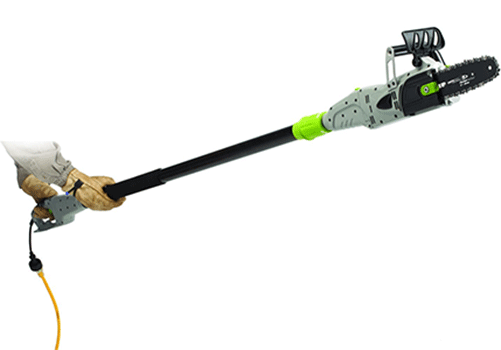 As a pole saw, this model has three adjustable positions to help with maneuverability. Fiberglass shaft helps to reduce some of the weight. Chain tensioning has to be done manually. Even though this is a versatile tool, 10 lbs. for a 6.5 Amp motor does not satisfy the weight to power ratio. 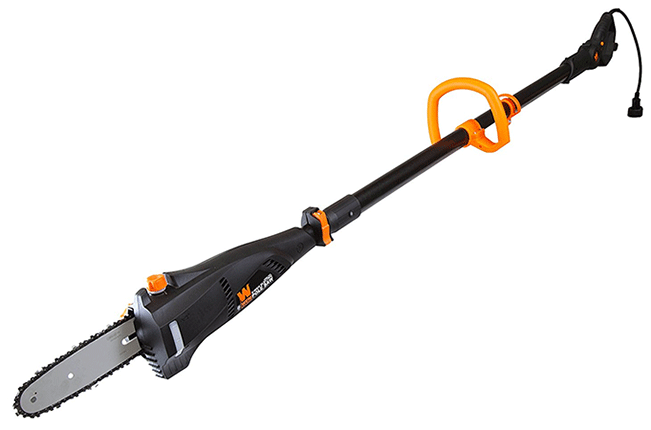 This Black + Decker PP610 is powered by 6.5 Amp inline motor and is equipped with a 10-inch Oregon bar and chain. The extension pole can reach up to 9.5 ft. and provides the operator with plenty of control. Like many of the other models on our list, this model features an automatic oiling system that will help to ensure the bar and chain are properly lubricated. The system is also equipped with a clear oil window so the operator can see how much oil remains in the reservoir. Overall design provides the user with optimal balance and control. Does not include bar and chain oil when you purchase the pole saw. 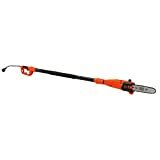 This electric pole saw from WORX is a little different than the others you have seen on the list to this point. Unlike the traditional chainsaw design most pole saws utilize, the JawSaw has, well, jaws that secure the limb while a 6-inch bar and chain cuts down and through the limb. Powered by a 5 Amp motor, this model weighs just under 12 lbs. and can access limbs as high as 12 ft. Additionally, this tool actually serves as two tools, a saw and also a pole saw when the shaft is attached. Jaws provide an additional layer of safety. Can reach further than many of the other saws on our list. 12 lbs. can feel very heavy in a short period of time. Our third and final entry from Sun Joe, the SWJ800E, is powered by a 6.5 Amp motor and can handle branches up to 7.5-inches in thickness. In addition to being able to cut limbs safely, this electric pole saw has enough power that it can also be used for cutting thin logs. The SWJ830E can also expand to nearly 9 ft., affording an overhead reach of 15 ft. The cutting head can be adjusted between 0 and 30 degrees and the 8-Amp motor can cut materials up to 9.5-inches in thickness. The self-lubricating 8-inch Oregon bar and chain makes maintaining this tool easier. Plenty of reach and weighs less than 10 lbs. Typically found at reasonable prices. With a smaller motor than its cousin, the SWJ803E, you would expect this model to have less weight. Now, for the moment you have been waiting for, our number one pick. The Remington RM1025SPS has a 10-inch bar and chain that is powered by an 8 Amp electric motor. This combination tool, a chainsaw, and a pole saw, can extend to a maximum overhead length of 15 ft. 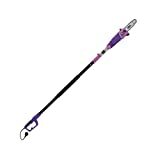 Along with a nonslip comfort grip, the shaft features flip and lock clamps that make adjusting the length of the pole saw simple and fast. If you need to go between a chainsaw and a pole saw, this model does so without the need for tools. The 8 Amp motor provides plenty of power. Simple to use and adjust. Great value and one of the lower cost models reviewed. Of all of the models we reviewed, this is the heaviest at nearly 13 lbs. If the thought of taking a chainsaw to the top of a ladder to trim branches sounds incredibly unsafe, you are correct. Working with a chainsaw or a ladder each have their own unique hazards. When you combine the two, those hazards are dramatically increased. This is when you realize that a pole saw is a tool you simply must have in your arsenal of lawn and landscaping equipment. If you can imagine placing a chainsaw on the end of a long broom handle, then you have an idea of what a pole saw looks like. Pole saws make pruning branches in high locations an easier and much safer task. Pole saws can either be manual, gas powered, or electric. Currently, electric pole saws are the most popular due to their simplicity and mechanical reliability. Unlike a manual pole saw that requires a great deal of effort to use, and gas powered pole saws that, while typically more powerful than electric pole saws, can also have a plethora of mechanical issues, electric pole saws only need to be plugged into an extension cord and they are ready to go. Just as with any other tool, you will want to find the electric pole saw with certain features that will help to ensure you get the most out of the pole saw. Here are a couple of factors to consider before you commit to a purchase. Power-to-Weight Ratio: While finding the lightest electric pole saw may sound like that ideal strategy, doing so could lead to owning a saw that will not have enough power for serious cutting. However, buying a large, heavy electric pole saw can be uncomfortable to use over an extended time. Look for a saw that offers plenty of power for most common jobs around the home without being overly heavy. Price: As with most tools, the price can be a significant factor in the type of electric pole saw you select. Fortunately, electric pole saws are cheaper to build and cost effective to operate when compared to gas-powered models, making them a financially advantageous. Additionally, with so many models on the market, there are plenty to chose from at reasonable prices and more than capable of getting the job done. The Remington Ranger meets all of the established criteria we mentioned before our review. It provides plenty of power and should be able to handle just about any task you throw at it around the home. Even though it is the heaviest model we looked at, its benefits and features make up for this single blemish.